Scenes from Super Quiz Bowl 2018. 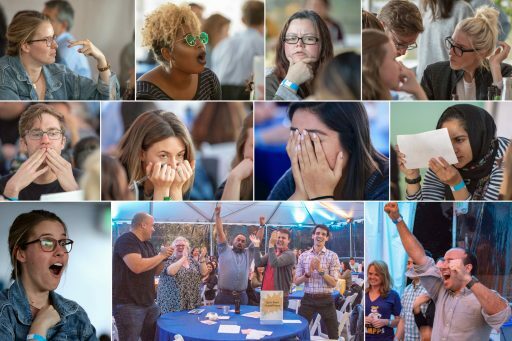 UCLA Luskin’s annual trivia competition was held for a sixth year on May 31, 2018, inside a tent on the 3rd Floor Terrace of the Public Affairs Building. Organized by Luskin Director of Events Tammy Borrero with assistance from students and numerous staff members, the structure of the event led to a tightly competitive night, with more than 100 people in attendance and various teams of students, faculty, alumni and staff from all over UCLA Luskin still in contention until final tallies were made. 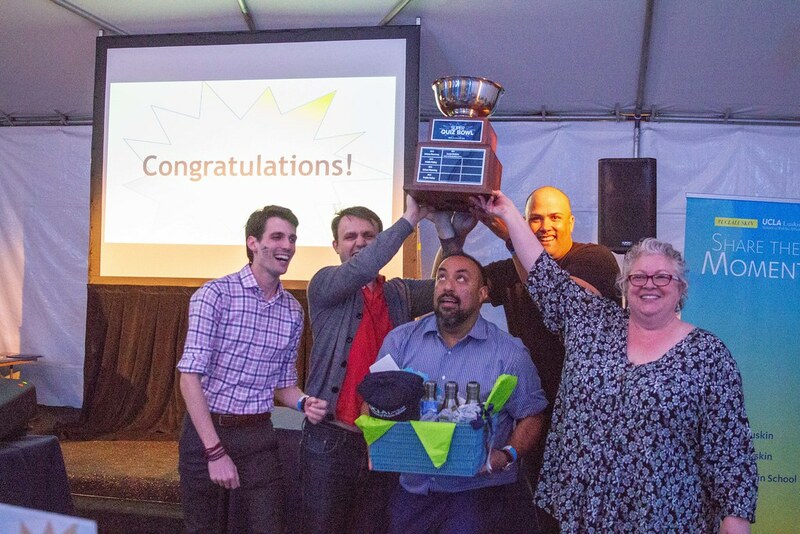 In the end, Public Policy snagged first and second place thanks to Quiz Bowl ChAMPPions (helmed by UP SAO Sean Campbell) and Bees Get Degrees (with alum and Luskin Center staff member Kelly Trumbull). City Bootyful, with Juan Matute of the Lewis Center and ITS leading the charge, got Urban Planning on the map in third place. Team No Faculty, headed by alumna Alycia Cheng, finished just short of third and a near-sweep for Public Policy. The winning team’s name will be engraved on the new Super Quiz Bowl trophy, joining previous winners such as teams led by faculty members Brian Taylor and Sergio Serna, both of whom were back this year but ultimately fell short of capturing the magic a second time. Grad Night funding was again based on participation, and 50 percent of the proceeds will be divided among all three UCLA Luskin departments because each department fielded at least one team. Urban Planning won the other categories related to attendance and total team participation. In addition to the numerous student participants (some returning for a second try and some testing their Luskin knowledge for the first time), the event brought in several faculty participants. In addition to Taylor and Serna, the faculty on hand were Kian Goh, David Cohen, Michael Manville, Ayako Miyashita Ochoa and Joan Ling. Participating alumni included Taylor, Manville, Ling, Trumbull, Matute, Cheng and James Howe. Staff members who competed were the winning team’s Campbell, plus Social Welfare’s Tanya Youssephzadeh and Public Policy’s Oliver Ike. Executive Director of External Relations Nicole Payton provided several questions. Many other staff members and students helped out as needed and hovered in the background to join the fun and cheer on their friends and colleagues. As the pictures posted to the UCLA Luskin Flickr feed show, it was a fun-filled night of friendly competition that brought the entire UCLA Luskin community together to wrap up the academic year. Members of the UCLA Luskin community gathered at Wattles Farm on Oct. 7, 2017, to serve as leaders during UCLA’s Volunteer Day. 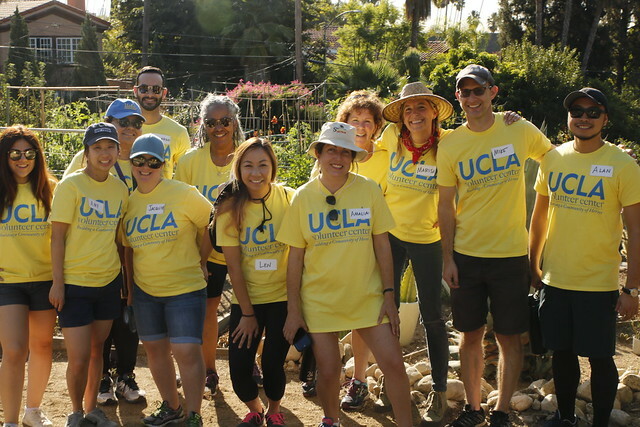 Once on the farm in the heart of West Hollywood, this assorted group of Luskin faculty, staff and students organized and worked alongside UCLA undergraduates to participate in ongoing work there. Wattles Farm is an organic community farm whose mission is to provide the area’s diverse local population with a rare opportunity to participate in sustainable agricultural practices. Luskin volunteers not only got to spend a morning aiding with maintenance of a sustainable mainstay of Los Angeles, they also further united with UCLA and the greater Los Angeles community through conversations and life stories shared over snacks of oranges, granola and water. Hover over the image below to access a Flickr gallery of photos taken that day by Aaron Julian.